The Jerusalem Press Club has invited Professor Joel Kaplan, 15 Newhouse journalism students and me to learn about and tell stories in Israel over Spring Break 2018. This is an ambitious project: we're visiting all four corners of the country, from Jerusalem and the West Bank to the northern border with Lebanon and Syria to Tel Aviv on the Mediterranean Sea to the Dead Sea and the Negev desert. Check out our itinerary. The students come from all walks of Newhouse: Magazine, Newspaper and Online graduate, Magazine undergraduate, Newspaper and Online Journalism undergraduate, Goldring Arts Journalism graduate and Broadcast and Digital Journalism graduate and undergraduate. 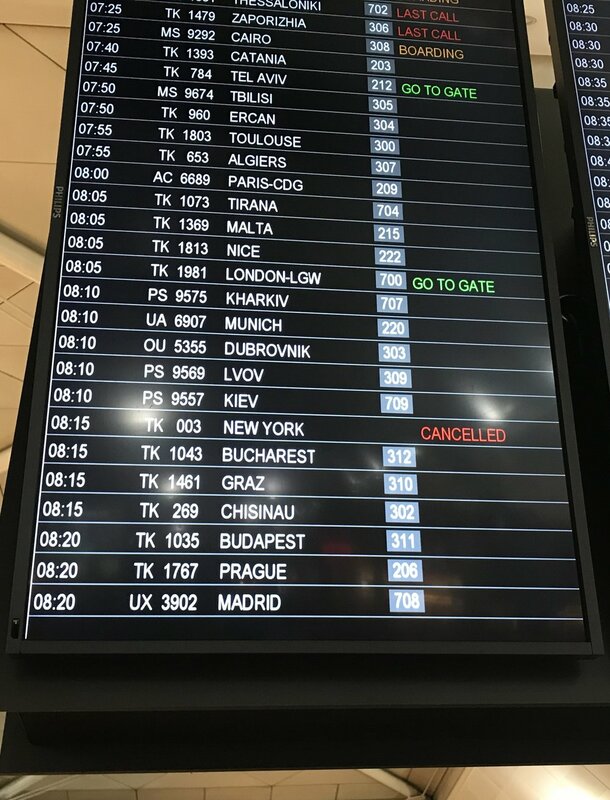 We're off to a rousing start, plowing through the snow in Syracuse and making our JFK ➡ IST ➡ TLV flights with plenty of time to spare. Please check back here for updates on the stories the students are telling. You can also follow us on Twitter #newhouseinisrael. One of the things you learn quickly in journalism, is no matter how well you plan, there's always something that can go wrong. The crack staff at the Newhouse Cage arranged for us to carry on all our equipment in sturdy cases. Good plan - broken equipment doesn't help us when we arrive. What we didn't plan on was Turkish Arlines limiting not only the size of carry on luggage, but also the weight. Turns out our sturdy camera kits were too heavy. What to do? Check the cameras and risk them leaving our sights or come up with Plan B. We chose Plan B. The students would take the cameras out of the sturdy cases and carry them on in their backpacks. Much lighter. They checked the sturdy (heavy) cases. Not ideal, but in journalism, you have to "make it happen." Newhouse students adjusting and adapting to circumstances. Camera kits too heavy? Let's just take the cameras. But of course, as soon as we could, we packed them safely away again. Arriving at Ben Gurion airport in Tel Aviv. If you've come all this way, why not start BIG? Our first full day in Israel took us to some of the most holy places on the planet. The Temple Mount is sacred to Muslims. A stone atop the hill is considered the spot that connects Heaven and Earth. Over the centuries, humans built an honorific plateau to mark a location so worthy. As with much of the Middle East, control has changed hands depending on who was the conquerer of the day. At the moment, Muslims are in charge. A golden dome marks the site. The big deal for Jews is the Western Wall, one of the walls fortifying the man-made Temple Mount. This is where Jews came for centuries to lament the loss of their temple at the top of the hill. Now, anyone can come to pray. For Christians, the most holy place is the Church of the Holy Sepulchre, built upon the sites where Jesus was crucified, buried and resurrected. The coolest part – you can touch all the sites. No ropes, no guards, no alarms. Top 5 Street foods: 1) falafel 2) shoarma 3) borakas 4) shakshuka 5) hummus. We expect to be digging in to a variety of stories in the coming days. And, as is customary for the Newhouse mafia, we represented. The Jerusalem Press Club has put together a schedule to really give the students a taste of what's going on in the Middle East. This is not a one-sided presentation that makes Israel or the Palestinians out to be the good guys, bad guys, victims or perpetrators. In fact, one student said today he hoped to finish the trip with a firm understanding of which side was right. He now knows that's not going to be possible - what a great thing to learn. Woman walking near the checkpoint in East Jerusalem. We started with a drive through East Jerusalem past the wall/security barrier (depends on whom you ask) to Ramallah. "It's like two different worlds right across the street from each other," our tour guide said. Indeed, the images of a much more prosperous and bustling West Jerusalem contrasted starkly with the garbage-strewn, traffic jammed East Jerusalem. Professor Khalil Shikaki is the foremost pollster of the Palestinian people. You want to know what Palestinians think? This is the guy to ask. He told us the tide is changing as the younger generation of Palestinians grows ever more tired of corrupt and inefficient government. Perhaps it could lead to a breakthrough in how to solve the up-to-now intractable conflict between Israel and its Palestinian neighbors. Next we heard from that very government the younger people are disenchanted with. Elias Zananiri is vice chairman of the Palestinian Committee for Interaction with the Israeli Society and clearly blamed Israel's insistence on building and expanding settlements in the West Bank for the lack of progress in solving this problem. So we went to one of those Israeli settlements/occupations (depends on whom you ask). Miri Ovadia, a representative in the Binyamin regional government, invited us in to her living room in her home in Halamish and served us tea and coffee and cookies. To her, Israelis are not occupying, they're merely returning to the lands of their forefathers, building connections between the past and the future. The future of the Palestinians isn't solely dependent upon the decisions the Israeli government makes. There are people like billionaire businessman Bashar Masri who are taking things into their own hands, building a Palestine on their own. It's a village called Rawabi, just north of Ramalla, that comes complete with zip lining, Roman amphitheater and fine shopping. So far the town has about 5,000 residents, but the goal is a proper city of 40,000. Masri says success here shows what can be done to modernize life in the West Bank. One thing is clear when you come to Israel and the West Bank: everyone has a story and is willing to tell it. That's the fun and interesting part for journalists. Our students rose to the occasion and took on tough topics without hesitation. They could tell when it was time to perform their jobs as reporters and ask tough questions and not just sit there as stenographers. Yes, all the people we spoke to had their points of view. But, they were their perspectives. Getting to the truth, or at least telling the other side, is a great lesson learned on this trip. It wasn't all work. We took an hour to wander the streets of downtown Ramallah, exploring street food and the markets and shops. 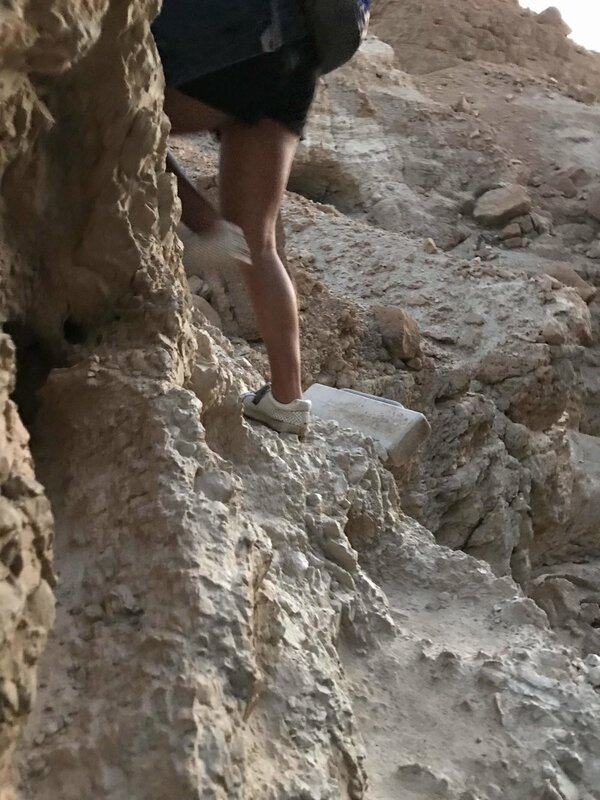 What makes a visit to Israel so astounding is being in the places you've heard of for... pretty much ever. Our quest to understand the history and reasoning and passions behind what's going on in the Middle East continued today in the West Bank - this time south of Jerusalem. We began in Gush Etzion, a conglomeration of Jewish settlements with a long, long history. (Everything over here has a long, long history.) Rabbi Alan Haber greeted us with a genuine New York City accent. That's where he lived until he decided to move his family here decades ago. Why? To return to his roots. He says this is his family home, and to him, family is the millions of Jewish people who lived here before him. In fact, he met us under the Lone Tree, a symbol of hope for Jewish people while they had been forced out of this area and before they could return. Jews would look from miles away and say to their children: "See that lonely tree, that's where we're from," Haber said. Leaving the settlements, we crossed to the other side, literally and, as is so often the case here, figuratively. We drove to Bethlehem to the Palestinian side of the wall/security barrier (depends whom you ask). Graffiti speckles the wall, some poignant, some vulgar, some political, some hopeful. The despair the Palestinians feel personally (imagine a wall to keep you away, you, just because of who you are) and economically (imagine how much more difficult it is to go to work when you have to go around a wall only to get to a checkpoint) comes through in the painted pictures. This place holds so much meaning for the Palestinians, a man came up to our tour to make sure we were hearing his side of the story. The moment got a little tense as guide and passerby debated terminology (wall versus security barrier) and who was here first. In the end, a five-minute snapshot of discussions that have been going on for thousands of years. Students interviewing Shaul Judelman, a member of Roots, "a local initiative for understanding, non-violence and transformation." One group that's trying to change the debate by having more debate is called Roots. Jews/Israelis and Muslims/Palestinians are sitting down and talking, taking time to find common ground. How strange is this? The Israeli we interviewed, Shaul Judelman, said he hadn't met a Palestinian until he was an adult. Never spoke to one! It's that distance despite proximity that's driving him to push for greater understanding between the people on both sides of the conflict. "Step out of the objective truth, because it's worthless," Judelman said. Instead, focus on the subjective, the feelings, the emotions - that's what's driving the two sides apart. One of the things you can't escape during a visit to Israel is the momentousness of the Biblical geography. The names and places are so familiar because they're in so many religious stories. Even if you aren't religious, you likely know the famous place where the night was silent and where the manger replaced the bed. The tiny doorway to the Basilica of the Nativity contrasts with the huge number of people who line up to see the place where Mary gave birth to Jesus. The beginning of the line to see where Jesus was born in the Basilica of the Nativity. The line down the steps to the underground cave where Jesus was born. On a personal note, seeing the spot where Jesus was born and then, just a few feet away, where his mother Mary placed him in a manger was surprisingly meaningful. I didn't expect to feel such a connection. From afar, the Middle East's eternal arguments and wars over whose land is more holy and to whom it belongs can seem perplexing - is it really all worth it? But now, after being in the Basilica of the Nativity, it's a little more clear to me. There's something about this place that makes the history real. The traditions and holidays, the stories and songs aren't derived from an amorphous past, they're part of a continuum. When you get to see and touch the history, you become part of it. Newhouse Newspaper and Online Journalism student Riley Bunch speaks at the Jerusalem Press Club. We wrapped up the night with a correspondent's dinner at the Jerusalem Press Club. Fine dining and conversation with students and reporters from The Washington Post and the Alhurra news channel as well as experts on the Middle East. What a great way for the students to learn from the people who are doing what the students dream of doing. Because religion plays such a big role in Israeli society, people like Yarom matter-of-factly say things that seem out of place in American culture. For example: "You came to a Jewish state, so the least you can do is go to Cypress to get married." What? At first blush, that sounds like a pretty harsh statement. She's basically saying: leave if you want to get married. The only marriages officially performed in Israeli are between two Jews. People of two different religions have to leave the country to get married. This is a controversy here, but not for Yarom. But here's how Yarom explained it: If the point of the state of Israel is to promote Judaisim, then the best way to do that is to create more Jews. Every time a Jew marries someone from another religion, the children produced in that marriage are, in a sense, lost - they won't become Jews. So, to her it's logical the only official marriages are the ones that produce the children that will further Israel and the Jewish state. Outsiders should know that coming in and if they don't want to play by those rules, then they should have their weddings somewhere else. After an introductory talk, Yarom took us on a tour of the Orthodox neighborhood of Jerusalem. Because the women were working, we saw few on the streets, but lots of men. Yarom explained how each element of a man's attire sends a message about where he's from and which strain of Judaism he practices. The hat, coat, even the socks all give clues. A Hasidic Jew wears a long coat and a round hat. A Lithuanian Jew wears a short coat and a fedora, she said. These clothes come from Orthodox haberdashers. Moshe was nice enough to show us around his shop, called Enzo Rosso. Newhouse students getting an overview of Yad Vashem, the Israeli Holocaust museum. From there we went to Yad Vashem, the Holocaust Museum. This humbling experience left many of the students without words. There's not a lot to say. More questions than answers. The museum takes you through the progression of persecution to isolation to execution. The museum's goal is to not let the individual people who suffered get lost in the massive numbers. It's easy to simply look at the Holocaust as millions of Jews killed. But to personalize the suffering, to make it individual, forces you to think harder about what happened. The museum's archive of victims is its most dramatic attempt to make sure each person is remembered. Some 4.6 million names have been collected on forms called Pages of Testimony. Anyone can fill one out and send it in. The museum will research to confirm the person was a victim of the Holocaust, and then the sheet goes into a binder. The collection is astounding and humbling. 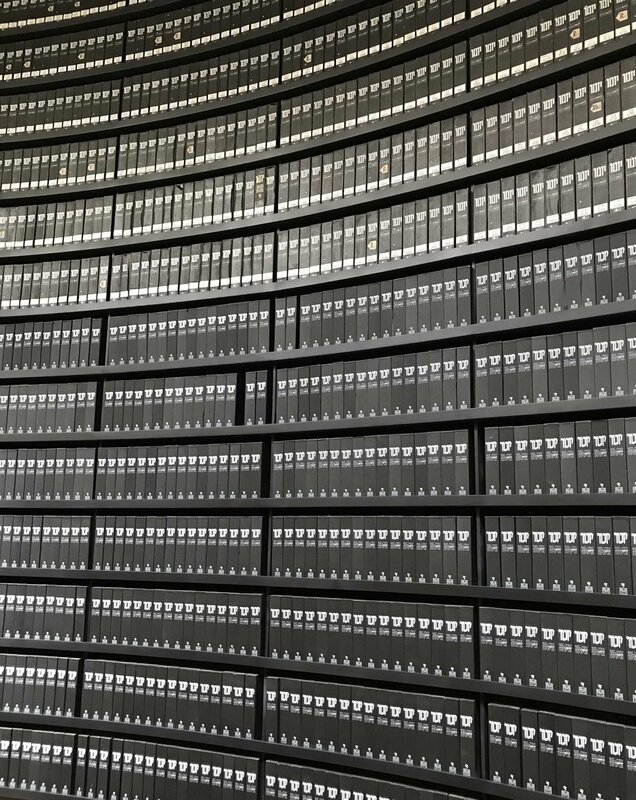 Some of the thousands of binders holding the millions of Pages of Testimony, documenting who died in the Holocaust. The museum is designed so you start at the closed, darkened end, but progress toward the light. We checked out of our Jerusalem hotel and headed north for a tour of Israel where it borders Lebanon, Syria and Jordan. This is a key part of the tour because it helps to explain the mindset of the Israeli people and its government. Essentially surrounded by countries that at one time or another have been hostile to it keeps Israeli politicians awake at night. Yes, at the moment, Israel is in good shape with Jordan, Saudi Arabia and Egypt. But parts of Lebanon are still hostile and Syria's civil war instability makes it unpredictable. Our first stop - Ziv Medical Center in Safad, where hundreds of Syrian refugees have been treated. The process is a tricky one for the doctors, because they don't really know who they're treating. They leave the security process up to the Israel Defense Forces. The IDF representative at the hospital explained soldiers wait at the border with Syria to collect and transport the injured to the hospital. They make sure the refugees are not carrying weapons or explosives but don't ask - and really don't want to know - more than that. No ID check. They don't know whether the patient is a rebel fighter or a member of ISIS. The Israeli government's position on the civil war in Syria is to take no position and instead just help out when it can. This comes at a cost: each patient is hospitalized for 18 days on average with a bill that comes to about $13,000 dollars on average. About 1,000 refugees have been treated. The students interviewed a man who said he hobbled 35 kilometers on crutches to the border after a bomb injured his leg. The IDF representative would not allow him to reveal too much information about himself (no pictures of his face allowed), because she feared for his safety when he goes back to Syria. It might not look so good he went to Israel for help. He said he has a wife and daughter, his opinion of Israel is much improved after his treatment, he'd assassinate Syrian President Bashar al-Assad if he had the chance and he can't wait to go back to Syria. The patient spoke in Arabic to a translator to who spoke in Hebrew who spoke to a hospital official who spoke in English. Newhouse students listen to Ziv Medical Center Spokesman Yarden Izak. All this helped Professor Joel Kaplan teach the students an important journalism lesson. It's always good to bring a healthy dose of skepticism to a story. Kaplan asked the students to think about the motivation the refugee had to tell his story. He'd been in the hospital two months. Did boredom influence what he wanted to say? What we would report was essentially third-hand information because it had been through two translations by the time we could understand it. Could the translators have influenced the story? Maybe the answer to both questions is "no," but that doesn't mean those questions shouldn't be asked. We left the hospital and continued our tour of the north of Israel heading east to the Golan Heights and the border with Syria. The location has great strategic importance militarily. Whichever country controls the mountain ridge controls the border. The significance is so clear when you see the drop-off is so steep on the eastern (Syrian) side. There's virtually no way a military force could climb the hill to take the top. That's why Israeli forces occupied the Golan Heights after the 1967 war and then annexed the location in 1985. Tour guide Nathan Landau explaining the history of the Syrian civil war. This is looking east from the Golan Heights. Syria is in the background. Newhouse student Christine Morton at the Golan Heights. The students were thrilled at the opportunity to tell stories from a location they'd seen and heard about in so many news stories already. They also realized how hard it is to stay focused on their jobs as reporters, knowing just a few miles a way, thousands of people have been and are suffering from a civil war. Majdr (left) and Afeef, the Druze brothers. We wrapped up our reporting day in Majdal Shams talking to a Druze family. The Druze are a minority in Israel that traces its lineage to Syria. They have their own religion and the two brothers we spoke to feel torn about where they are. On the one hand, they love the idea of returning to Syria - one said the year he spent studying in Damascus was the best of his life. But they also recognize and appreciate the freedom they have to practice their religion (a distantly-related form of Islam) in Israel. As we and our waistlines are beginning to discover, the food here is varied and awesome. Majdr and Afeef's mom is a great cook, and they welcomed us into their dining room for a Druze dining experience to die for. Signs appear in Hebrew, Arabic and English. The grind is getting to a lot of students, but not broadcast student Odeya Pinkus. We began the day at Kibbutz Dafna in Misgav Am in the northern part of Israel. These are collective farming communities that sprung up soon after Jews started returning to the newly created Jewish state. Barry Praag, who's originally from London, greeted us and gave us a tour. He explained the philosophy of the kibbutz - 100 percent communism. Everyone shared everything, no one wanted for anything. Barry Praag leading students on a tour of Kibbutz Dafna. In the early days, the collective even paid for people to go on two-month vacations overseas - what a system! But, Praag said human nature got in the way and showed how the Communist philosophy just doesn't work. Eventually, the lazy person figured out he didn't have to work and would still receive the same benefits. That two-month expenses paid vacation? You got one, for your whole life. Nowadays, some kibbutzes are successful and some have to borrow money from the bank to stay afloat. Praag actually works in the nearby town as a school teacher. He's not a kibbutz dairy farmer as he was when he started. Bomb shelter doorway at Kibbutz Dafna. The kibbutz are on the frontier of Israel, near the borders with neighboring countries that aren't always friendly. Misgav Am sits a few hundred yards from the border with Lebanon. It's also withing striking distance from Syria. In recent years, it's been pretty calm, but Praag said he remembered the days when bombs fell in rapid succession. That's why the community built bomb shelters. Israel's first prime minister, David Ben-Gurion, said the country owed its security to the people who are willing to live on the kibbutz on the border. All modern buildings built on the kibbutz are required to include bomb shelters, even though it's been a while since Praag and his compatriots have had to use one. Still, there are signs today things could go south. As we drove into the kibbutz, we saw on the border with Lebanon a large Palestinian flag blowing in the wind. Our tour guide explained this was a jab at the Israelis living nearby, to remind them Lebanon supports the Palestinian cause in the conflict miles away on the West Bank and in Gaza. So Beit Hagefen uses art to bridge the gaps that remain. The group believes by talking first about what Muslims and Jews and Christians might agree upon, rather than jumping into the politics, there's a chance to find common ground. All along the way, students continued to work on their stories. Newhouse broadcast student Tom Austen shoots video in the Haifa market. Newhouse broadcast student Rashika Jaipuriar conducts an interview in Haifa. Newhouse newspaper and online journalism student Riley Bunch shoots a photo for her story on Israel. From Haifa we drove down the coastline to Tel Aviv. The trip is reminiscent of heading south from San Luis Obispo to Los Angeles - miles and miles of sparsely populated beaches. We checked into our hotel, just blocks from the beach, eager to experience what we've been told is a drastically different vibe from what we've seen in other parts of Israel. We finished the night with a traditional Shabbat dinner at the home of a local Jewish family. After the opening prayer over wine and bread came plate after plate after plate of wonderful food: tomato salad, Jerusalem artichoke soup, barbecued chicken. Best of all was the cake and ice cream dessert made by the matriarch of the family, Sonia. She left Berlin at four years old when a Nazi grabbed her father by the necktie and told the "ugly Jew" to get out. Her family moved to Peru, where she stayed for decades before returning to Israel. We had a nice chat in Spanish. 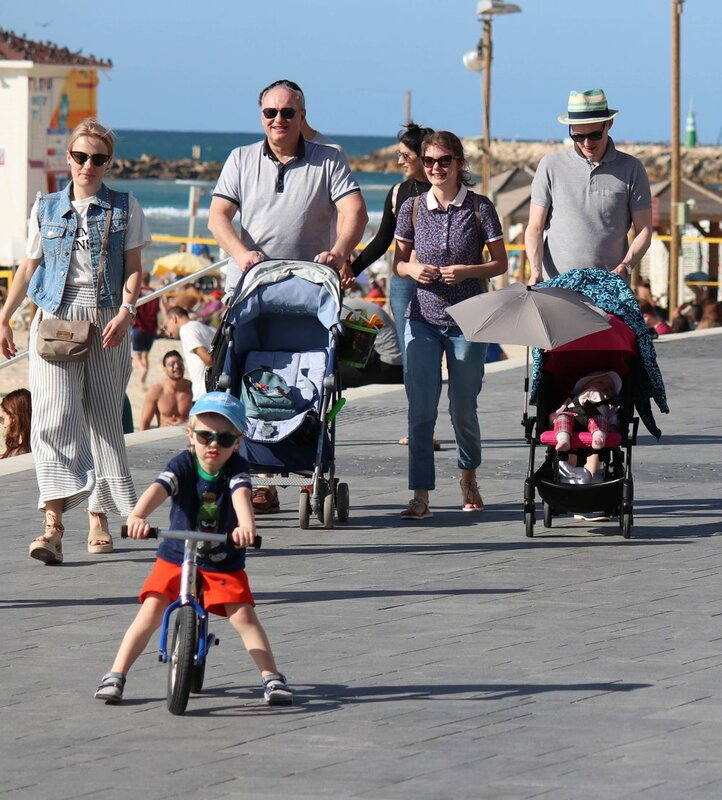 Tel Aviv is remarkably different from Jerusalem - it’s newer (duh, so is pretty much everywhere else), it’s less religious and has a multitude of babies, bikes and dogs. With no tours scheduled until the afternoon, our group spread out to explore. First stop, the Mediterranean Sea. A wide promenade separates the beach from the city. High-rise hotels overlook a series of coves, each created and protected by breakwaters. Because it was the Sabbath, the Jewish day off, throngs of tourists and locals joined us on the waterfront. At noon, restaurants with a view already had one-hour waitlists. Head inland in from the beach and you find several commercial streets lined with malls and individual stores. But, pretty much all were closed today. This is an example of the tension between the more-pious Jerusalem and the more secular Tel Aviv. Israeli law says no businesses will be open on the Sabbath. This has been relaxed a little to allow entertainment and dining businesses to welcome customers. But straight-up shops still remain closed. Not much argument in Jerusalem, but there are some businesses organizations in Tel Aviv that think this is limiting how people can enjoy themselves on the weekend. 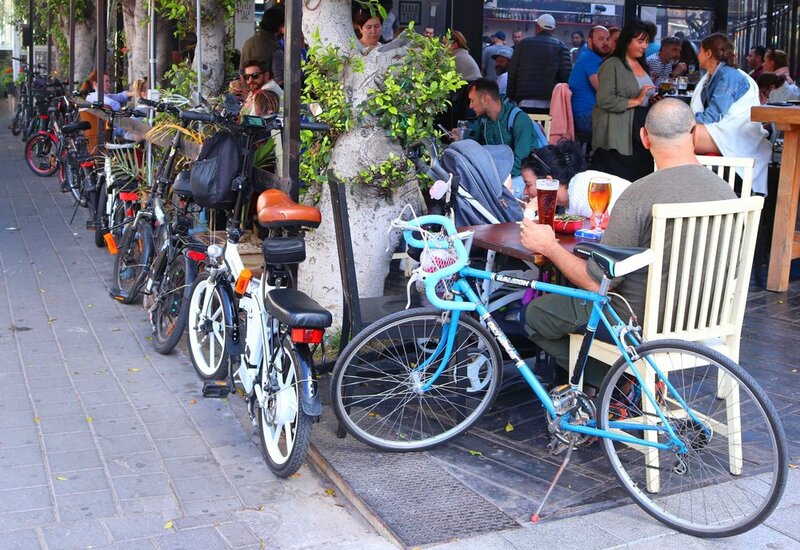 Stores being closed didn’t stop Tel Avivians from pouring out of their apartment homes onto the street. The sidewalks bustled with energy and people. Waves of brunchtime conversations washed out of corner cafes. Dogs walk into the restaurants with their owners. And there are so many dogs, particularly large ones, which is surprising, given this is a big city with small living spaces. Those who didn’t have dogs in tow had young children with them. The number of strollers was striking. I recalled the Orthodox Jewish woman who, a few days ago, told us the whole point of Israel is to perpetuate Judaism. The more Jews the better. Lots of young families on the streets show lots of people take this idea to heart. Another sign of the city’s hip attitude is bikes. Watch out – they’re coming in all directions. Tourists really should wait for the green light before crossing the street. 😀 Whether it was due to the Sabbath or some other reason, cycling to lunch seemed a popular choice. 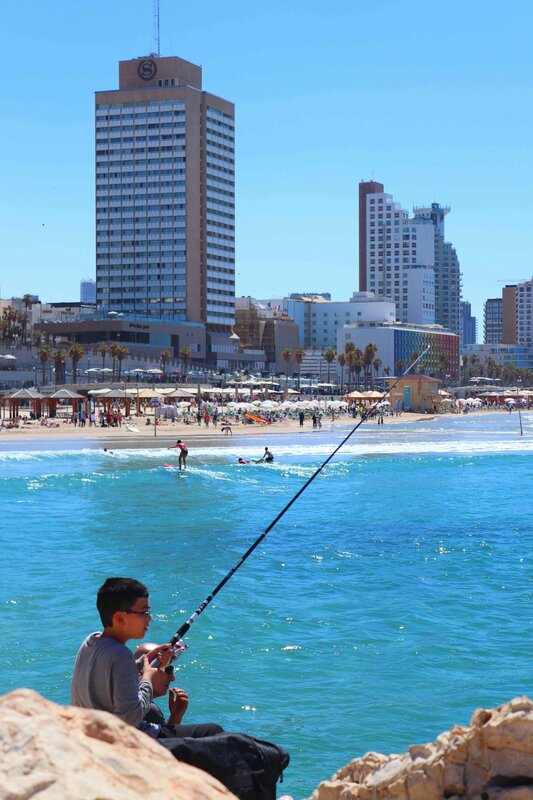 Tel Aviv’s past is not a big part of the story here. Relatively modern, but sometimes tired, offices and apartments dominate the city. It’s so unlike Jerusalem where every corner seemed to tell a story (of biblical proportions). And that really is part of the story. Tel Aviv has bars and night clubs, a big gay community, hardly anyone walking in Orthodox clothes. All this contrasts with Jerusalem. The country’s two largest cities each affirming a distinct identity. An appropriate metaphor for Israel and its place in the Middle East. Just 75 minutes south of the cosmopolitan, wordly Tel Aviv, we had an otherworldly, or at least other century, experience in Tel Sheva. This is a small Bedouin town in the Negev Desert. The Bedouins are an ancient nomadic people who wandered the area now known as the Arabian Peninsula, Israel, Syria and Lebanon. They’d set up tents, stay a while, pack up and then wander off to the next spot. This worked until civilizations started making countries and drawing borders. Now passing from one place to another isn’t allowed. About 220,000 Bedouins remain in the Negev in southern Israel. Some live in unrecognized villages that are basically out of touch with modern society. Others live in recognized villages that receive electricity and water and health services from the Israeli government. The building where we ate dinner and learned about the Bedouins who live in the Negev Desert. Driving to Bedouin home in Tel Sheva, Negev Desert, southern Israel. Driving down the windy, unpaved road, we arrived at a shack. Inside Sohayla Abo Rkeek told us about her experience as a Bedouin woman trying to make a life for herself despite the domineering disagreement of her husband. Sometimes openly against his will and sometimes without his knowledge, she was able to send her girls to high school and then college and maybe soon medical school. She has started her own businesses, first slaughtering chickens and selling them to other women in the village, and now welcoming tour groups and feeding them. She has passed the first part of her driving test and is saving up money for driving lessons. All this, again, against the will of her husband. As is the case with most trailblazers, her humility drew us all in. This is what she wants, so she’s just going to work hard to get it. The students felt fortunate to be able to interview her and document her story. Newhouse broadcast student Nathan Dickinson interviews Bedouin woman Sohayla Abo Rkeek in Tel Sheva, Negev Desert, Israel. Sohayla Abo Rkeek sits for an interview with Newhouse students. 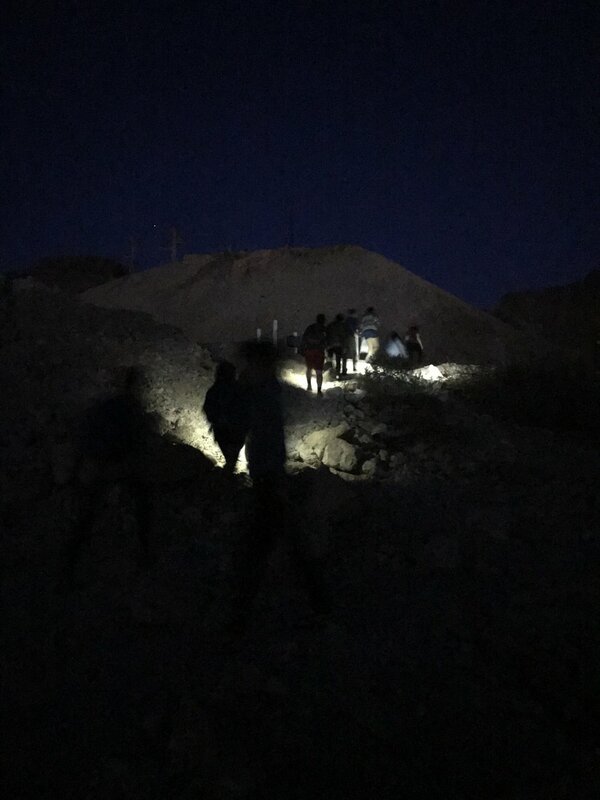 The smartphone alarms went off around 4:15 a.m. to get us started on our 45-minute hike up the mountains to watch the sun rise over the Dead Sea. 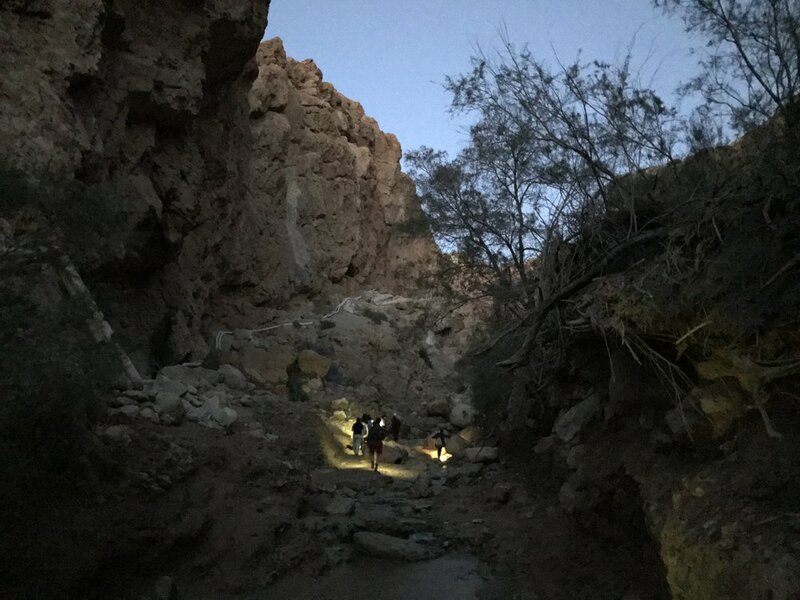 Through the dark we marched, first through the small river left over from last week's rain. Then over the boulders that had fallen down the mountain who knows how many centuries ago. Then up and up, and up some more, twisting and turning and slipping and sliding on the loose gravel. In the dark, no easy task, but we all stuck together and make it to a landing with a great view of the sea. Slowly the sun rose over the mountains on the east side of the sea, in Jordan. Well worth the effort, even if coming back down was sometimes more treacherous than going up. Newhouse students at sunrise overlooking the Dead Sea. After all that pre-dawn exercise, what could be more appealing than a dip in the sea, the Dead Sea? The name comes from all the minerals and salt in the water; it's so toxic, nothing can live there. Get the water in your eyes or in a cut and it stings like crazy. But, people from all over the world come for what the water does to your skin. Just a few minutes and you take 30 years off your epidermis. Also, it's pretty fun because you can't sink. It's a weird feeling to be in water and sense that something's pushing you up rather than pulling you down. One student said she felt like a buoyant Swann. You feel like a duck in the Dead Sea - floating without trying. Salt crystals are all along the bottom of the Dead Sea. After a little tourism, it was back to journalism work with a visit to the Center for Digital Innovation in Be'Er Sheva. Israel has the highest number of tech startups per capita in the world, after Silicon Valley. Be'Er Sheva is trying to capitalize on that entrepreneurial spirit by offering people with ideas a cheaper way to get started. Because the city is pretty much in the desert, it's nowhere near as expensive as the trendier, hipper Tel Aviv. Yotam Tzuker is CEO of Tech 7, an innovation company in The Negev Desert area of Israel. The military develops and uses a lot of technology and because military service is compulsory, lots of young people get exposed to creative ideas and then want to continue after their service is fulfilled. Israel was founded on a philosophy of trial and error. Remember, this was a country created only in the last century. It's been trying to figure things out as it goes along, in the same way an entrepreneur does. From business, our attention turned to bombs. We visited Sderot, one of the villages next to the Gaza Strip that frequently suffers from attacks. The residents we spoke to said their lives are turned upside down by the constant threat from Gaza. In fact, one of our hosts is a child psychologist who said she treats lots of kids with PTSD. 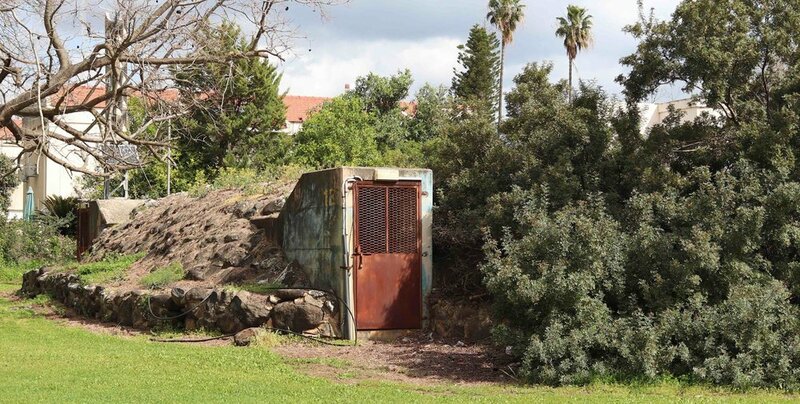 Street side bomb shelter in Sderot, Israel. Our hosts at the Social Rights Center say the Israeli government should try harder to figure out some sort of solution with the leaders of Gaza. The threat of an incoming rocket is so constant, there are shelters all over town, as common as a bus stop shelter. Several years ago, the shelters were havens for homeless people. No one wanted to use them because they were dingy and stinky. Now, they've been cleaned up and as soon as the siren goes off warning of an incoming missile, the doors automatically open letting people in to seek refuge. Kibbutz Nahal Oz sits right on the border with Gaza. Lots of bomb shelters here, too. But, the folks who live here have also decided their homes and their dedication to Israel are worth the risk. The idea an attack could happen at any time is so ingrained, the shelters have been painted with children's storybook characters to help the young ones feel safer going inside. Man walks child past bomb shelter at Kibbutz Nahal Oz, on the border with Gaza. A short bus ride got us to the actual border, where we found two Israel Defense Forces soldiers on the lookout. They readily welcomed our group. One was an Orthodox Jew who had decided to enter military service rather than study scripture at Yeshiva. The violence and tension on the border ebbs and flows. 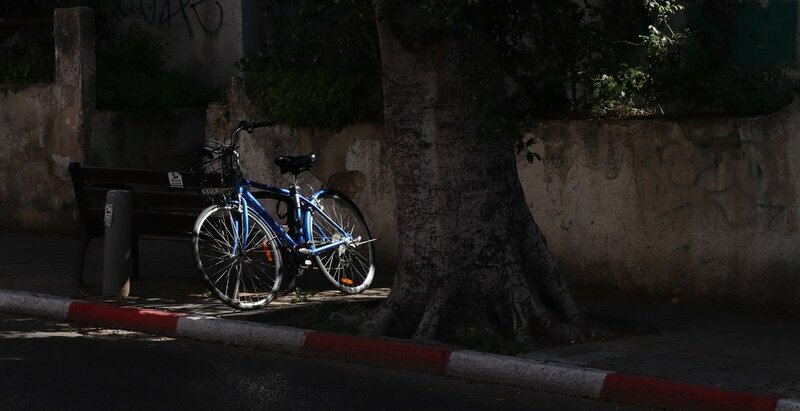 In the past week, two incidents showed why Israel feels the need to have patrols standing by. First, Israeli jets launched airstrikes in Gaza in response to two bombs that exploded near troops on the border. Second, the Israeli military announced it had found and destroyed to tunnels it says are used by terrorists to funnel weapons and launch operations. This was a busy day of press conferences as the Jerusalem Press Club pulled some strings for us to meet with decision makers in Israeli government and society. First, two members of the Knesset, the Israeli parliament. Newhouse students ask questions of Meirav Ben Ari, Kulanu Party member, during a press conference in Tel Aviv. Meirav Ben Ari is a member of the coalition that's currently in power with conservative Benjamin Netanyahu as prime minister. While her focus is on social issues, she also made sure to defend the government's policy in answers to students questions. For example, the Bedouins in the Negev Desert are trying to maintain their centuries-old nomadic ways, by setting up temporary homes and then moving on to other places when they see fit. Put another way, squatting. The Israeli government has gone after some of the Bedouin communities doing this, and essentially kicked them out. Ben Ari didn't shy away from this, saying it's about principle: if you are living in a house that doesn't belong to you, you have to leave. Labor Party representative MIchal Biran answers questions from Newhouse students in Tel Aviv. Next up, Michal Biran, a member of the opposition Labor Party. Befitting someone from the party that's out of power, there was pretty much nothing the ruling coalition could do right. Biran accused it of cutting off funding for education and health care, of creating a bigger gap between rich and poor and of preferring the status quo rather than working for a better future for the country. On this last point, she blamed the ardently religious Jews: "The problem with our system is you need the Ultra-Orthodox to form a coalition" government. Despite their contrasting ideas on a lot of policy issues, both shared common ground on the value of protecting Israeli territory. They both believed Israel is surrounded by people who might not be so friendly and in the mission of the state being a haven for Jews around the world. Because Haaretz is one of the best-known papers in Israel, lots of foreign reporters covering the MIddle East read it. But, Benn lamented the fact that's the extent of the research a lot of those correspondents do. He said he can tell when a reporter says: "I read the local paper so this must be what's happening." Benn thinks it's a waste of time for reporters to pretend to be unbiased. "The idea that journalists should erase their opinions is unrealistic," he said. This, of course, led to an interesting conversation about bias in the news media. What Professor Joel Kaplan and I try to teach is how to separate one's personal views from a story. The idea is not to pretend a reporter doesn't have biases, but to identify them and then do one's best to make sure they don't show up in the reporting. The Israel Defense Forces have been in the news quite a bit lately given the rising tensions with Gaza. So a chance to visit with the IDF spokesperson for international media was most appropriate. During times of calm, there are some 300 foreign correspondents in Israel. That number jumps to 3,000 when the conflict heats up. IDF Spokesman Lt. Col. Jonathan Conricus talks with Newhouse students about the military and the media in Israel. Lt. Col. Jonathan Conricus, spent a lot of time telling the students how he tries to frame stories in the media so the IDF looks as good as possible. Sometimes that's easier said than done. When the story is about a confrontation between Israel's military and the military of another country, it's easy. Conricus says he tells a narrative about a battle between equals. But, when the story is about Israeli soldiers and, say, a teenage Palestinian protestor, things get more difficult. Those situations are a public relations nightmare because the images tell a story of strong versus weak. In the end, what got a little concerning for the students was when he said part of his job is to "strike fear in journalists" by warning them he's watching the stories they do to make sure they're done to his liking. He's happy to give journalists access to the IDF when he can, but he wants them to know he's keeping tabs on how the stories play out. Former Israeli diplomat Nadav Tamir talks to Newhouse students. The final stop of the day was at the offices of the Peres Center for Peace where we heard about the efforts of former Primer Minister Shimon Peres to bring peace to the Middle East from one of his confidants, Nadav Tamir. Tamir obviously idolizes Peres and recounted the many ways the former prime minister led Israel toward peaceful outcomes to the conflicts with its neighbors. Tamir said the key to Peres' leadership was his eternal optimism and belief there was always a way to find a win-win solution by avoiding zero-sum negotiations. From the debriefing we went to Walla News Digital Network, a television and web outlet that's just getting started in Israel. The main anchor is Jacob Eilon. He answered lots of questions from the students especially about covering politics in Israel. The challenges are similar to the United States in that the leaders (Prime Minister Benjamin Netanyahu and President Donald Trump) both call out what they see as media flaws on a regular basis. While he said that's a challenge for journalists, the key is to search for the truth over the long term. That's how you win over the audience's trust. The #NewhouseinIsrael team overlooking Tel Aviv from the roof of Walla News Digital Network. The succession plan for the Palestinian Authority, given the current leader, Mahmoud Abbas, is 82 years old. The story behind Israel detaining teenagers who are accused of violent protest. The political and logistical implications of the United States moving its embassy from Tel Aviv to Jerusalem. How Israel is treating Africans who are seeking asylum. The way politics influences and is portrayed in Israeli theater. The Bedouin community and how its goals are helped and harmed by the Israeli government. The origins of the high-tech boom that's taking over Israel. Israel's leadership in water desalinization and what that means for neighboring countries. The country's education system and how it affects various minority communities. Programs that successfully promote peaceful co-existence between Israelis and Palestinians. How various communities deal with the threats that come with living on the border. Why is it so many Israeli soldiers leave the country for India after they complete their service? How do reporters do their jobs given the security risks? The future of the Temple Mount and the role it plays in the peace process. How Palestinian investment is redeveloping the West Bank. Some of us had a hankering for one last shoarma. 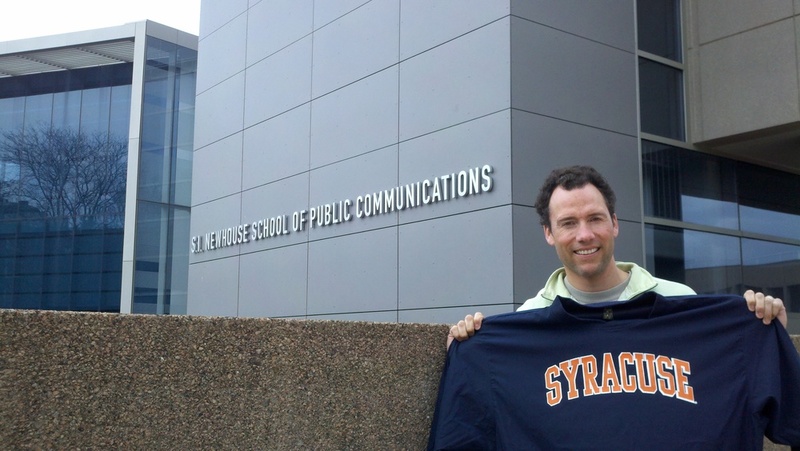 The students were outstanding ambassadors for Newhouse and Syracuse University. At all times they were professional and, even more impressive, they didn't let the fatigue and frenetic pace get to them. No matter how tired or how frustrated, they held it together. That 15 students could start AND finish as friends is a testament to their maturity and seriousness. The schedule the JPC created for us certainly made the most of our time. Ten days isn't a lot to cover an entire country, especially one with so much to see and understand. Still, the tour guides and speakers helped us get a feel for what's happening in Israel and with its neighbors. As they pushed us to get from appointment to appointment, sometimes we wished we'd had more time to explore. But in the end, the consensus was a full schedule is the best way to achieve our goals of telling stories about many aspects of this area rather than just focus on a few issues. The Tel Aviv sun sets on our #NewhouseinIsrael Spring Break 2018 trip. Depart TLV at 1 a.m. Arrive IST at 4:10 a.m. Depart IST at 8:15 a.m. Arrive JFK at 12:35 p.m.
Our IST to JFK flight was one of the 4,000. Airport kiosks in Istanbul dispense visas to Newhouse students so they can enter Turkey. Newhouse students waiting at the Istanbul Airport for a flight home to Syracuse. To its credit, Turkish Airlines offered to put us up for the night at a hotel, including free breakfast, lunch and dinner. But as has been the case with this group from the beginning, it didn't want to waste a free day in a foreign land when there was history to see. About half the team took a quick nap, showered and headed out to see the sights. We took public transit to the historic district of Istanbul, known as the Sultanhamet. Particularly memorable was understanding the context of Muslim construction in Istanbul in light of our time in Israel, having learned about the religious battles for supremacy over the centuries. Newhouse students enjoy lunch at The Terrace Restaurant, overlooking the Blue Mosque in Istanbul. Newhouse students at the Blue Mosque in Istanbul. Closed for construction inside, but pretty views outside. Newhouse students at the Grand Bazaar in Istanbul. 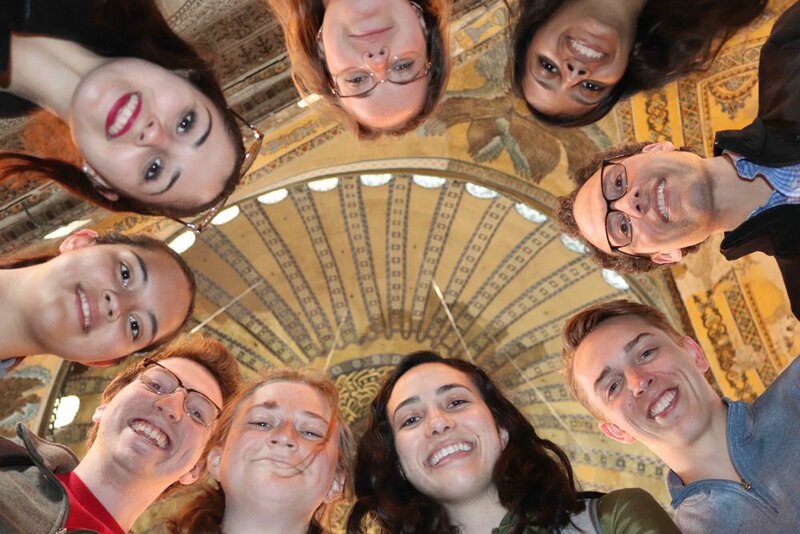 Newhouse students inside the Hagia Sofia. After a full day of sightseeing, it was back to the hotel and sweet dreams our flight home would really happen tomorrow. We headed to the airport at 5 a.m. to make sure we wouldn't miss our flight. It didn't make any difference, because there was no flight - no extra plane. Students sprawled out on the airport floor wondering what to do. Hope for a new flight? Go back into Istanbul? Sleep? At the airport? At the hotel? Many of them were now on their third day wearing the same clothes. Newhouse students gathered on the floor at Istanbul's airport waiting for a flight home to Syracuse. Professor Joel Kaplan is not one to take no for an answer. So when he talked to the agents at the Turkish Airlines ticket office and heard "there are no flights to New York until Saturday" (the day after tomorrow), that wasn't good enough for him. He asked them to be flexible and to investigate flights to other east coast cities. In the end we were booked on a flight to Boston. So while we waited for our new afternoon flight, we made sure Newspaper and Online Journalism student Sam Fortier had a birthday to remember. Who doesn't like to celebrate an occasion like this in an airport lounge? His classmates bought him a gift he'd been searching for on the streets of Istanbul - salep. It's a wintertime drink served hot with a dash of cinnamon on the top. One of the students described it as a mix between rice pudding and flan. He loved it. We believed it once we were in our seats - yes, we're really heading home. The folks at Newhouse did a great job lining up a bus to pick us up. And after a six-hour drive, we ended up back where we started. Home sweet Newhouse. The #NewhouseinIsrael team disembarks at Newhouse, after an 11-hour flight from Istanbul to Boston and six-hour bus ride from Boston to Syracuse. It's 3 a.m.